Our clothes storage solutions with pull out organisers or rattan baskets are part of our extensive bedroom storage range. From tie racks to shoe racks we've got everything you need to optimise your bedroom storage systems. Our laundry baskets, hanging rails and coat hooks help you keep things tidy in the bedroom. Bedrooms serve a number of roles depending on the context of the living space. It can be incredibly challenging to meet all of the various functions when space is limited. Maximising your storage space is critical to maximising the functionality of your bedroom. With limited space in most homes, it is important to make your bedroom storage as efficient as possible. Creating adequate storage will help to ensure that your clothes and other possessions remain organised and clutter-free. The wardrobe is an excellent place to start with a number of bedroom storage solutions available. From pull out shoe racks to bedroom hanging rails, Lark and Larks has all of the bedroom storage essentials required to make your bedroom a comfortable and fully functional living space. But before you begin purchasing storage solutions, it is necessary to analyse your space and understand your needs first. You can begin by analysing the amount of space available in your wardrobe and what you need to store in it. It is important to estimate how much space your clothes will take up, as well as the full-length vertical space required for items that hang. Vertical length is important as it will determine whether you have room for multiple rows of storage which can help to maximise space and double the amount of storage. By using all of your vertical space efficiently, you can create more space to store your possessions in the wardrobe while using less space in the main bedroom. When determining how to use your storage space, be sure to distinguish between daily needs and long-term storage. You might want to reserve the most accessible spaces for your daily needs and use upper shelves for storing items that are used infrequently. A pull out tie rack and a pull out shoe rack can be extremely effective bedroom storage solutions for infrequently used items. Whether you need a storage unit or an optimised storage solution, our extensive range of bedroom storage items including rattan baskets, pull out shoe racks, and organisers will help you get the most out of this important living space. Our pull out tie racks, laundry baskets, coat hooks, and bedroom hanging rails will ensure that your bedroom is always comfortable, tidy, and efficient. Our handy bedroom storage laundry basket fits conveniently into your cupboards. This practical and space saving storage solution is equipped with a fixing bracket and door stay. It is specially designed for retro-fitting with base hinged doors and standard side mounted doors. The basket will seamlessly hook over the included fixing bracket for easy fitting and removal. Use this practical laundry basket in bedrooms, kitchens, and utility rooms. Our extensive range of pull-out organisers come in a variety of sizes and widths to fit in most wardrobes. With additional function as a drawer unit, these individual pull-out organisers are ideally suited for bedrooms where they provide practical and accessible storage inside wardrobes serving various bedroom storage requirements. Our individual organisers range in width from 300-1000 millimetres wide. There is no more efficient way than our stackable shoe rack for solving your bedroom storage dilemmas. Our convenient and practical stackable shoe racks come complete with brackets and clips providing you with the perfect solution for the storage of your shoe collection. As each unit is sold individually, you can simply customise the number purchased according to your needs with room to add more in the future if necessary. 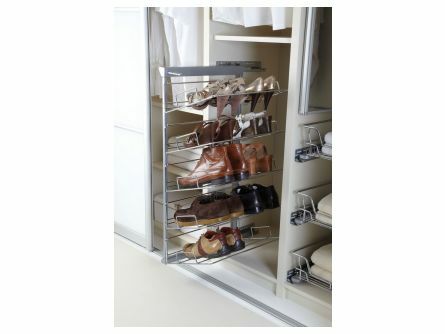 The stackable shoe rack is ideally mounted onto a low level internal shelf or the base of the wardrobe. Our three-tier pull out storage shoe rack is elegantly designed for the modern household with an aluminium and chrome finish. This useful space saving solution is conveniently side mounted to store your entire shoe collection while maintaining convenient access at all times. If you’re seeking a practical storage solution for your tie collection, look no further than our twin rail tie rack. This fitted rack comes in a chrome or brass finish and can be used for storing scarves, belts, or ties. Simply attach it to the rear of your wardrobe door. Our smart looking pull-out storage tie rack is just the solution for saving space. It can be used for ties, scarves, or belts. 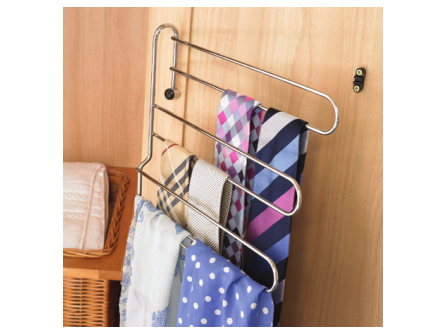 The conveniently side-mounted pull out tie rack is finished in an anodised aluminium and chrome finish perfectly suited for the wardrobe of a working professional. Our bedroom storage pull-down hanging rail is a convenient storage solution for storing items in ceiling height wardrobes. The pull-down hanging rail is finished in a stylish black and chrome finish that is available in two distinct sizes covering widths between 600 and 1100 millimetres. 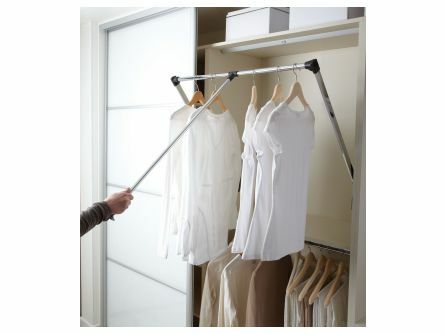 With a maximum load of 12 kilograms, our extendable pull down hanging rail with soft closing mechanism provides seamless access to your items stored at ceiling height. 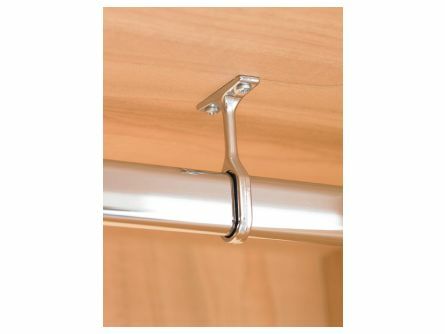 Our oval hanging rails provide the smart bedroom storage solution in a chrome or brass finish. These smart and practical rails come in a range of sizes with a selection of matching centre and end supports that can be ordered separately. A railing custom designed for a 90 degree corner section is also available. For a convenient and versatile bedroom storage solution, look no further than our round hanging rails that are available in a number of lengths. These smart looking rails come in a chrome finish with a selection of matching centre and end supports available that can be ordered separately. Select from a choice of 2.5 or 3 metre lengths. Our storage curtain rails are made with steel and finished in stylish chrome. Our selection of rails measures 6 millimetres in diameter with centres ranging from 360 to 450 millimetres. They are ideally suited to hanging curtains or other fabrics behind glazed doors. 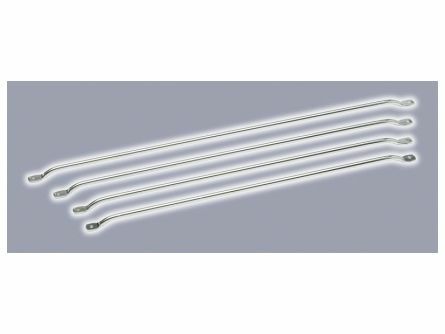 Whether you are seeking additional privacy or looking to hide clutter and storage areas, our curtain rails are just the solution for your bedroom storage needs.